As the first prescription digital therapeutic approved by the FDA, the treatment will be distributed and supported by a specialist-staffed service center. reSET — a substance use disorder treatment that was the first software-only therapeutic cleared by the FDA — is now commercially available for clinicians to prescribe to their patients, according to a release from Pear Therapeutics and Sandoz, a division of Novartis with which Pear partnered back in April. But while physical prescription drugs are usually handled through a pharmacy, the process is a bit different for the digital therapeutic, Dr. Yuri Maricich, Pear’s chief medical officer and head of clinical development, told MobiHealthNews. Prescribing physicians will write a script that is sent to Pear’s reSET Connect Patient Service Center, which staffs specialists who guide the patient through downloading and using the app. Outside of that wrinkle, though, Maricich said that disseminating the treatment to care centers has been “very similar” to how a pharmaceutical company might put a novel treatment into the wild. Still, Pear and Sandoz seem to be playing it safe with the new treatment modality — beyond general distribution and sales, the Patient Service Center is also equipped talk patients and providers through any questions or troubles they might be having. 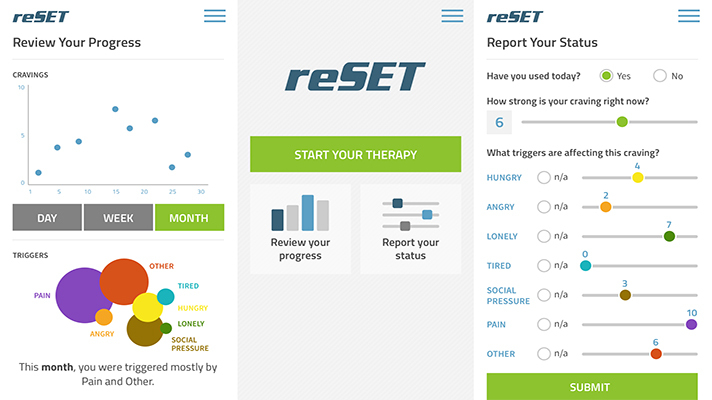 reSET is a 12-week digital cognitive behavioral therapy program accessed through an app and designed to accompany outpatient care delivered by a physician. According to Maricich, it is the only treatment authorized by the FDA for patients aged 18 years and older experiencing addiction to and dependency on stimulants, cannabis and cocaine (as well as alcohol). Depending on its success, Pear and Sandoz’s rollout of the novel treatment could serve as a model for any subsequent prescription digital therapies looking to go to market within the next few years. Further on down the road though, Maricich said that he anticipates patients and providers won’t require quite so much guidance. This release is also a culmination of Pear’s ongoing partnership with Novartis — or more broadly, a successful relationship between a digital therapeutic maker and a global pharmaceutical company. For Pear, that relationship has yielded the guidance and support of an organization well steeped in adapting new products for a complex market, Maricich explained. Maricich isn’t alone in his views. During a recent discussion of his company’s digital strategy, Jacob LaPorte, global head of digital development at Novartis, also described the partnership between Pear and Novartis as a long-term effort reliant on each company’s strengths. Pear’s dealings with Novartis isn’t limited to reSET alone. In March, the companies signed an agreement to collaborate on the development of two other similar products, one for multiple sclerosis and another for schizophrenia. These products sit alongside the rest of the digital therapeutic maker’s pipeline, which includes reSET-O for opioid use disorder, and are supported in part by the $50 million the company collected from investors at the top of 2018. Digital therapeutics' relationship with pharma and mainstream medicine has growing with each passing month — just the past weeks saw an $88 million agreement between Proteus Digital Health and Otsuka Pharmaceutical and the release of an official definition of the term from a consortium of digital health stakeholders.